Toronto narrows the series gap to 3-2 by holding on in Boston for a 4-3 victory. BOSTON — The Toronto Maple Leafs opened another 4-1 lead in Boston, and this time they held on. Five years after blowing a three-goal lead in a playoff elimination game against the Bruins, Toronto killed off a 5-on-3 and three more penalties to beat the Bruins 4-3 in Game 5 on Saturday night and force the series to a sixth game. Connor Brown and Andreas Johnsson each scored his first career playoff goal in the first period, and Tyler Bozak and James van Riemsdyk scored 1:19 apart in the second to make it 4-1 and chase Bruins goalie Tuukka Rask. “When you’re down a man six times – and it was six times – it’s ridiculous,” Toronto coach Mike Babcock said. Frederik Andersen stopped 42 shots for Toronto, which returns home for Game 6 on Monday. Game 7 would be back in Boston on Wednesday, if necessary. When the teams last met in the playoffs in 2013, Toronto twice won to stave off elimination and force the series to a seventh game. 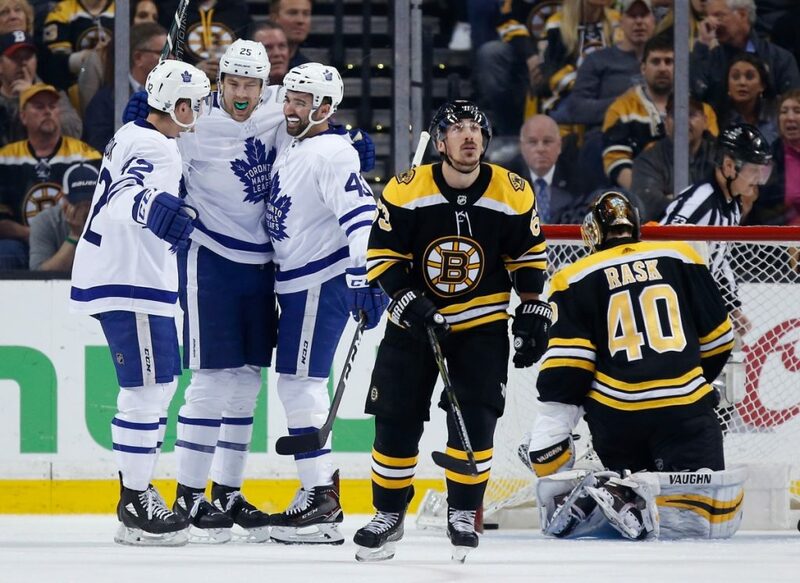 Once there, the Maple Leafs took a 4-1 into the third period before the Bruins won in overtime en route to their second Stanley Cup final berth in two years. Jake DeBrusk and Sean Kuraly scored for the Bruins. After missing one game with an undisclosed injury, Selke Trophy finalist Patrice Bergeron returned to the ice but not to the scoresheet; his line, which had 20 points in the first two games, was held without a goal or assist. Rask was pulled after allowing four goals on 13 shots before skipping off to the locker room when he was pulled with 8:05 left in the second. Anton Khudobin, making his first career playoff appearance, stopped all eight shots he saw the rest of the way. Toronto lost the first two games of the best-of-seven series in Boston by a combined score of 12-4, then won the third game at home before dropping the fourth to fall to the brink of elimination. Leading 4-1 midway through second on Saturday, the Maple Leafs gave Boston four straight power plays but killed each one off. Kuraly made it a two-goal game with about three minutes left in the second and Noel Acciari made it 4-3 six minutes into the third. Notes: Bergeron’s absence from Game 4 was a surprise, and his upper body injury remains a mystery. He skated on the off-day Friday and again on Saturday morning and was then cleared to play. … Grzelcyk had his first playoff point, and Acciari recorded his first playoff assist. … Khudobin made his NHL debut in 2010 but has been a backup since then and never saw the ice in a playoff game. … The game ended with fisticuffs in the corner. Bozak and Boston’s David Backes were in the middle.